John F. Kennedy once said, "Peace is a daily, a weekly, a monthly process, gradually changing opinions, slowly eroding old barriers, quietly building new structures." The Puntan Dos Amantes legend is part of the long road to peace that the Chamorro people have travelled. The legend is a memory from the beginning of generations of peace between the Chamorro people and the Spanish. It is a place where the beauty of peace is celebrated every day and there are numerous monuments and remembrances of those that treasure peace. None is more poignant or fitting than a monument constructed by the Northern Rotary Club of Guam that officially declared Guam a Peace Island. 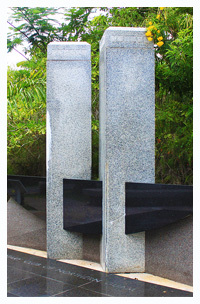 The monument was constructed as a solemn memorial commemorating those who lost their lives in the tragic events of September 11, 2001. The members of the Rotary Club of Northern Guam originally designed the memorial in 2001 for promoting peace and understanding, and to symbolize a Rotary Peace Island on Guam to join over 100 cities and islands around the world, which have memorialized their dedication to peace.